The kitchen is a place to cook, eat, gather and entertain. Whether the space is large or small, it’s one of the most popular rooms in a home. Small wonder, then, that it tops the list for remodeling projects. Whether the design calls for contemporary, transitional or traditional appeal, ProSource® of Erie has the products and expertise to make the project a success. With options spanning cabinets, hardware, countertops, faucets and sinks, your kitchen remodel will come alive, achieving the function and style desired. 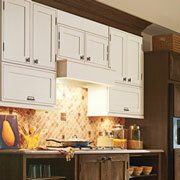 Updating kitchen cabinets is a great way to enhance the look of a kitchen. A variety of choices awaits you at ProSource, covering wood species (think: oak, maple, hickory, etc.) to style (e.g., slab, shaker, etc.) to color options such as white, gray, blue or numerous wood stains. 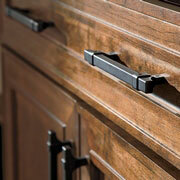 There are so many different types of cabinet hardware, from knobs to handles to pulls. Plus there’s an abundance of color finishes and material types available. Whatever personality statement is desired, you’ll be able to find the perfect match. From granite to marble to quartz, ProSource has a countertop that will dazzle the eye and perform with lasting durability. 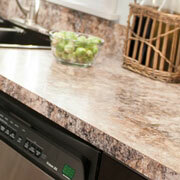 It will be nearly impossible not to be inspired by the the latest trends in countertops. Kitchen sinks are used nearly every day, so durability matters. But so does style, given how recognizable they are in the room. Our team can help you choose a complementary color, from while to black to stainless steel, along with the desired style to complete the look. 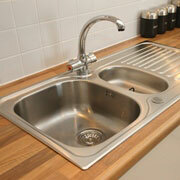 With various materials, sizes and configurations, the kitchen sink can combine functionality with eye-appeal. 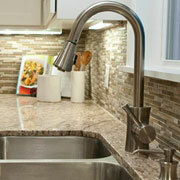 Faucets serve a dual purpose of providing water while enhancing the look of the sink. Available in a multitude of color finishes, including bronze, chrome and nickel, along with just about any configuration needed, there’s a match to be found. Visit our showroom to witness our extensive selection of kitchen faucets.